End all those pub arguments about music with The Xfm Top 1000 Songs Of All Time, the definitive guide to the best tunes ever recorded. 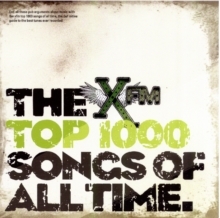 Collated from the annual 'Top 1000 Songs of All Time' listener poll, the most requested songs on the 'X-list' and suggestions from radio DJs and celebrity guests, The Xfm Top 1000 Songs covers all our best-loved tracks. Each entry contains a short explanation of why the song in question is so brilliant, features band trivia and chart stats and is accompanied with full-colour band photography and cover artwork throughout. User-friendly, accessible and up-to-the-minute, The Xfm Top 1000 Songs is a musical must-read, whether you're in need of inspiration for a party playlist, on the lookout for new music or you simply want to revamp your iPod.